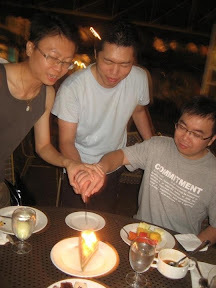 After so many years back, I'm back hopping by to my long-abandoned blog to mesmerize the memory I used to have. There are so many old posts that I shared ranges from my personal feeling, family matters, love moments.. and recently found a post that I shared about my poo colour! hahahah! 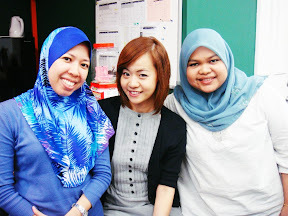 This make my hand itchy to continue in blogging to jot down more memories before i could ever forget. Dont' you think so? 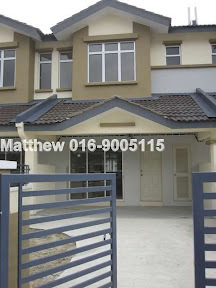 Based on the statistic, it seems there are some random people who popped by my blog mainly searching about "Alpha 18i" hahhah, in which I bought years ago back on 2012 for my new house at Klang (not new anymore now). I think mainly if there is search, there will be people who search through google, and apparently found my posts. That's how the blogging influences works. For now, allow me to spam you with some cutie photo of my daughters, my both lovely daughters in the recent HIT apps, SNOW. In blink of eyes, my both daughters, Ellysia & Valerynn has grown up. 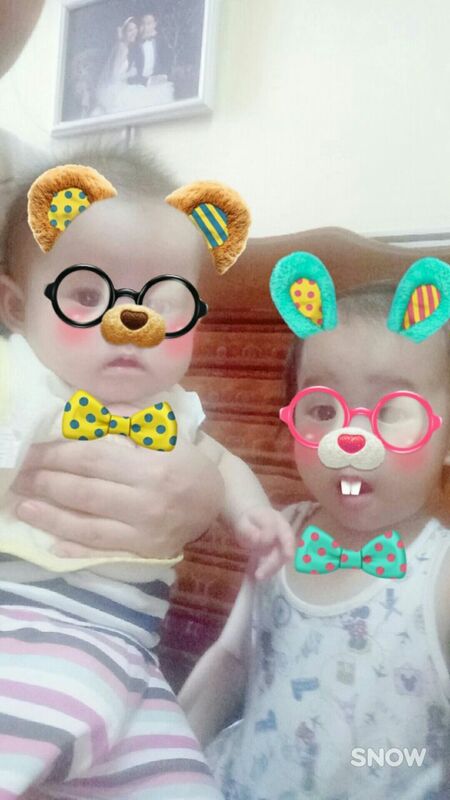 Both are 2 yrs old ++ and 7 months old respectively. Can you imagine how I could deliver and raise them into what they are today? I myself couldn't believe it neither. Maybe that's what people always say, when it comes, it will comes. 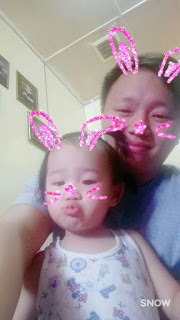 Was back at hometown last weekend, when my BIL introduce me the latest apps called "SNOW", in which have alot of cutie icons , animated gadgets / accessories for your selfie. Send fun video messages to friends on SNOW! 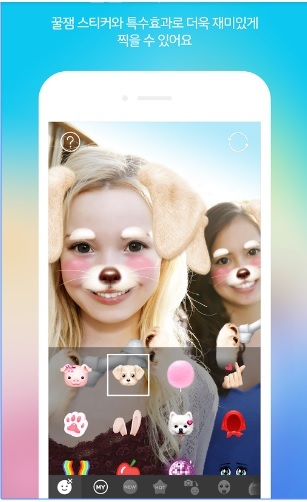 Take videos with hilarious face effects and send them to your friends instantly. You can respond to snaps from friends with texts and animated GIFs as well. Like this post? Nang me !! Click NOW! In blink of eyes (864782929283 blinking actually), year 2011 has ended and the year of 2012 has started. 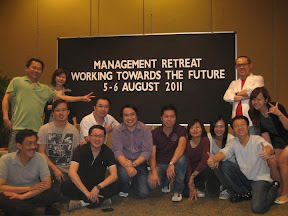 Recalling back, I've experiences alot of things for year 2011, live like a roller coaster, going up and down. 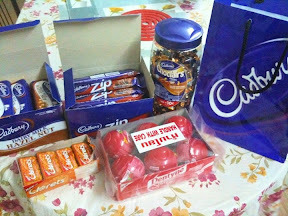 I still remember I was with Cadbury for early year 2011, feeling so excited joining the feh-mes chocolate company. And most important they gave me my expected salary, offering the job to me 1 hour after the interview! 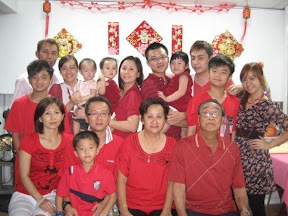 I was like sibeh happy, happy till like nobody business, telling and sharing it with all my family and friends. And everyone congratulate me and follows with a question "Buy chocolate got discount ah?" *sweat*... but infact really got discount de, as the staff/employees are entitled to buy at staff price. So everyone so happy can't wait for me to buy chocolate at the cheapest price. So after 7 months stands with her patterns, I resign and decided to back to basic in looking for another job. And I found this company at I-City, IT INSIGHT SDN BHD. As u all know, maybe not everyone know... 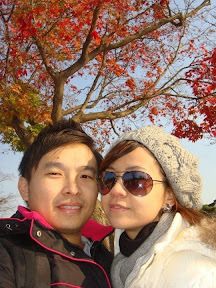 I had a bad past experiences in love at year 2010/2011. I was so down and somehow lost the way on how I should proceed to find my partner. 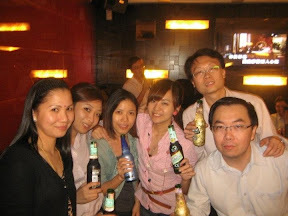 I still remember I started to join friends or colleague for beer happy hours after work, trying hard to make myself happy by hang-over, crying over the nights and wet my pillow, depression and hating my life. And at that moment, he appear and become my soul-mate. Who is he? Hehhehehe! You know I know la... Hahahahah! Vincent who used to be my colleague,now has become my lover, my beloved lover who will always be there for me. He treat me like a princess, treat me like his precious gold. 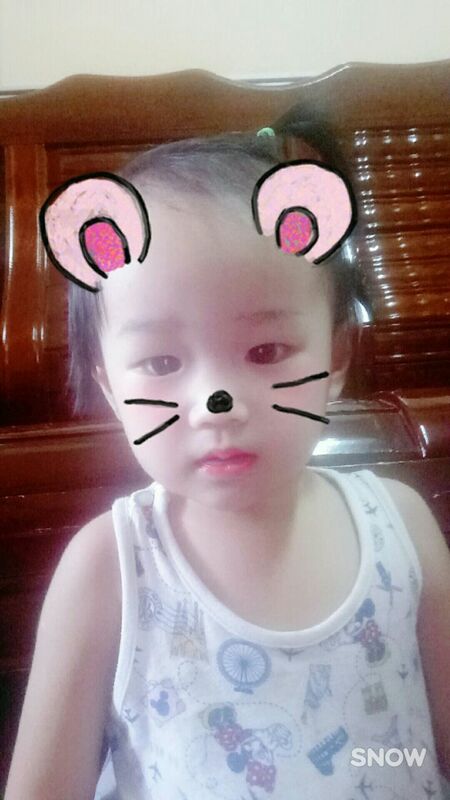 I know he will try his best not to hurt me, and giving his best to make me happy. We've been together almost 2 years (coming August), and I hope more years to go. 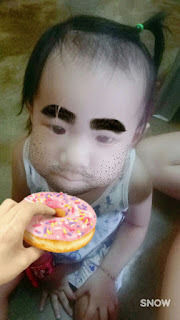 #Show off with another face-stick-face photo. 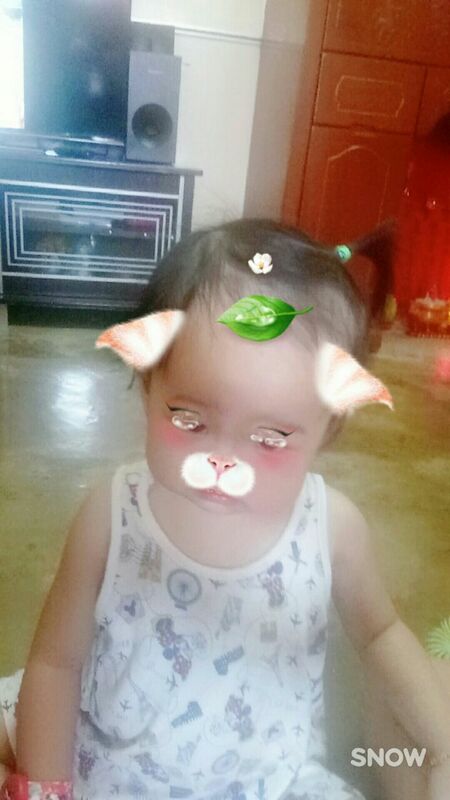 Hahahhaha! 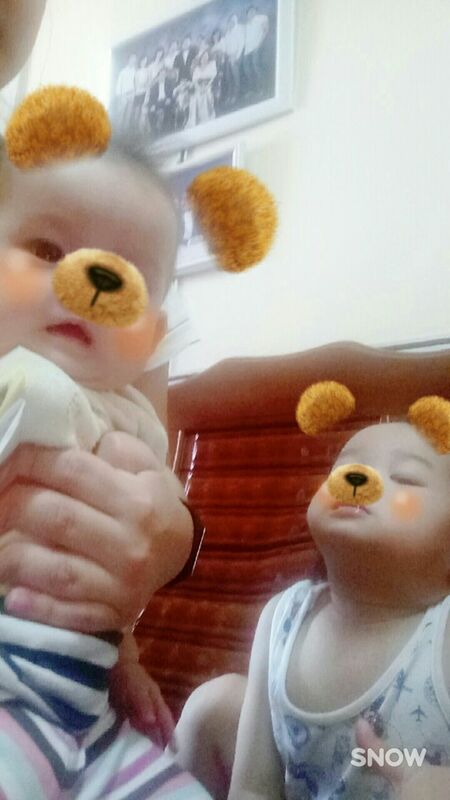 And with the exponential growth of Tam's family, it make me think when it will be my turn to get baby so I can together gather contribute in making the number bigger and bigger. Hahahha! You must be wondering what is IISB or who is IISB or what the heck is IISB? Haha! you can try search Google or even try to ask Siri whether she know anything about IISB? Actually IISB is my new company, and it stands for IT INSIGHT SDN BHD. I've been joining this company since July 2011. Hmmmmm.. *counting fingers*.. Ohhhhhhhh, almost close to 5months, entering half year being part of IISB. Isn't that fast? Felt like just joining this company like 1-2 months. 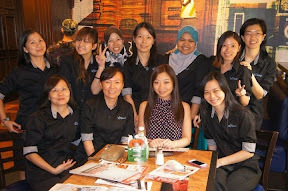 But I've been through alot with this company eventhough it's just for such a short time. I still remember for the second day joining this company, my boss brought me to meet customer, given me a task to prepare presentation slide in the first week itself. After 2 weeks joining this company, I was given 3 projects to handle. Wtf! Will it be too fast bah? 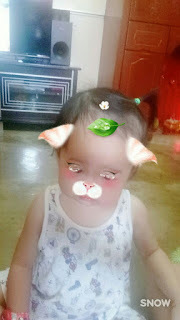 @. @ Thank God I manage to survive and thank God I manage to learn from it. I guess because of the struggle, after spending the effort in trying my best to learn from others, I was confirmed and promoted quite fast within 2-4 months time. Nevertheless after being confirmed and promoted from application consultant to project assistant manager, the responsibility on my shoulders getting heavier, whereby boss will always keep you in the mails, regardless it's hot-burning cases or something that boss require you to follow up. Customers rushing for projects deadline, business partner rushing for user training, boss rush for timeline project plan, boss rush for weekly meeting, everything just rush and rush. Anyway, I'm trying my best to cope and be myself in everything. *cross fingers everything will work out fine* OMITOTU!! ALILUYA! Back to my journey with IISB, there were alot of milestone which I've marked in my memory being with all of them, all IISB's gals and guys! 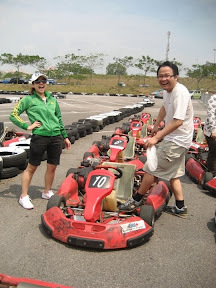 Let's start with the first activity that I can recall, Go Kart session with all of them. It's really fun, why? Since it's illegal to speed on the road, that's the only way we could push our pedal to the MAX without the worry of exceeding the limit and kena stop by "someone and being asked for "duit kopi". 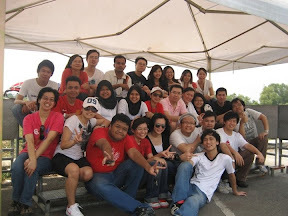 #1 Around 20-25 of us takes turn to play Go Kart under the hot burning sun! To add on, it was at 12pm... As a result, I got complimentary tanned-skin. Wtf! 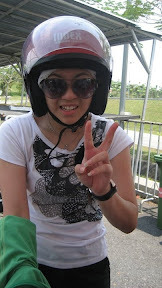 #2 Me after 25 of continuous laps on the field, with sibeh smelly helmet! #3 Happily laugh with the "gelagat" from him who always be the clown in the office! Hahaha! #4 We even build something "unique" during the game-session. 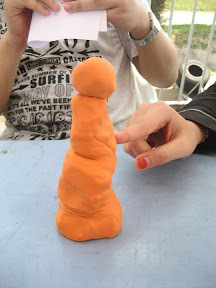 What do you think it looks like? Answer to be provided at the end of this post. Haha! 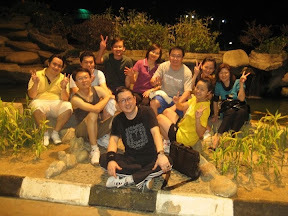 Anyway, it was a great trip especially when we are away from office to enjoy easy breeze there. 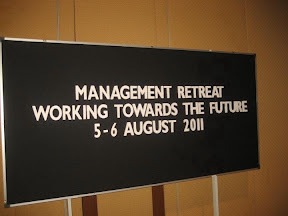 #5 Yes, Management Retreat "Walking Towards The Future". 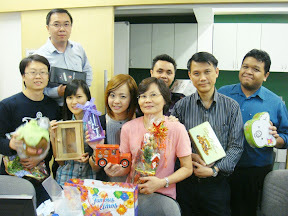 #6 all of the Bosses, HOD (Head of Department) and senior consultants and me! 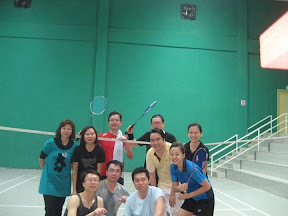 #7 We also spent sometime to exercise, to sweat, to challenge each other by playing badminton over the sport house. #8 Frankly, most of them are very playful, just like me. Adding me in, it make it even worst! Hahahaha! #9 celebrating their birthday .. 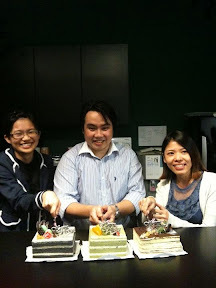 Cost saving, 3 of them sharing a slice of cake. Once we get our bonus, we will get one full for you all! lol! #10 See, once bosses are they, one cake for each of them! So luxurious birthday huh! Ok after celebration after celebration, back to out sports activities. 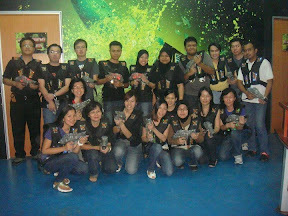 We also arrange for quite some activities such ad karaoke singing, and Laser Tag games nearby our office. #11 We drink together gather, shout together together, dance together gather. #12 Ya ya.. As you can see 'memang shout de! Hahahahaha! #13 ahahahha! Another guy who is shouting! 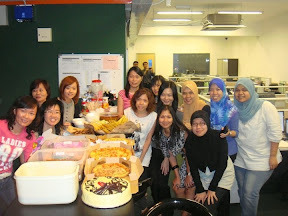 #14 Farewell for Janie, who joined us got 3 months. 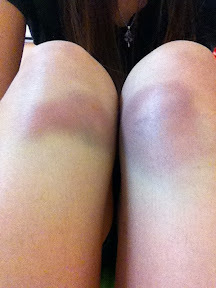 #15 this game is sibeh fun and because of this, my knee has gotten into serious bruises! #16 You see! How serious this is!! It took me 3 days to clear. Awwwww my beautiful leg... Hahahah! 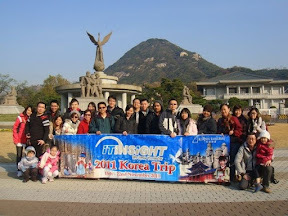 Maybe I'm lucky enough, i will get the chance to join for annual company trip very time me joining new company. 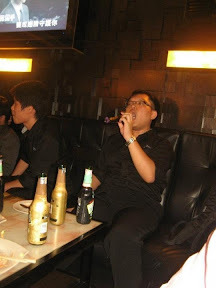 Last time, DSC I went to Bangkok&Singapore after half year joining, secondly went to Bangkok also with Faxcore after 3 months joining. 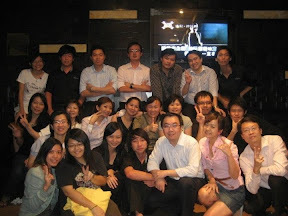 Same goes to this company, went to Korea after joining company 4months. (wow!!! Korea! *you must wondering so shiok!!!). Ya, quite shiok because I manage to be confirmed before they confirmed the number of pax with travel agency. So I do not need to pay my part. Another great thing, my babe is going with me. Yuhuuuu! Of course he need to pay his portion in traveling together. #17 All of us taking group photos together gather. #18 Of course me with babe taking dozens of photos!!!! Ok show one for you to see. Don't jealous wor ! Lolx! 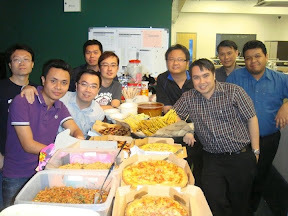 And recently, very recent, we organized Christmas Party Celebration with "makan makan " at office. 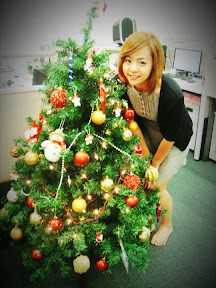 #19 Me with the small Xmas tree. #20 See, look at hoe many food we have!! it's really alot isn't? Hahahah! 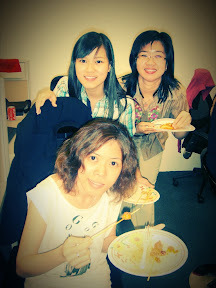 #21 Me with my colleagues. 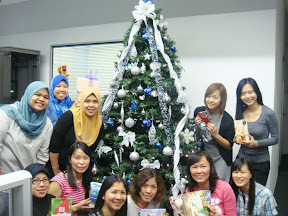 #22 All of us feel so excited with gifts! Hmmm, I'm wondering which one is mine? #23 Finally, time for unwrapping the gift. I got a coin-sundries container with interactive wind-mill. Thanks Najib! #24 Me being me, whenever you see me, there you see PHOTOS! took quite alot of photos in every each of event. Hahahaha! Fuhhhh! After 2 days if drafting, finally I guess I've covered much of the memories so far with IISB. Wow, so many things to talk and brag about eventhough it's just for like 5 months.. Wtf! 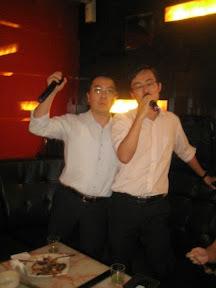 Anyway, hopefully we could mark more Memories and eventful events, provided mr yet to resign! Hahahahha! Goodbye to Lisa's Little World and the lovely readers!